The iconic Route 66 stretches not just across the country, but throughout our history as well. Route 66 Road Signs and Advertisements takes you on a journey to see some of the colorful history of commercial signage along the Mother Road. Here’s a look at some signs across the west. At first, private trails also ran across the Texas Panhandle. The route that became US 66 was known as the Postal Highway east of Amarillo and the Ozark Trails Route west of Amarillo. The Ozark Trails route came into Amarillo from Wellington and then headed west, connecting with the National Old Trails Road at Las Vegas, New Mexico. The 1919 book Ozark Trails Route made no special mention of Amarillo. Vega and Glenrio were the only Texas communities highlighted as “live towns that are taking a public spirited interest in promoting this route.” In other words, they paid. When the federal highway system was approved in 1926, not a single mile of concrete had been poured in Texas and motorists had to open gates between Shamrock and Amarillo. The first hard-surfaced section was in the San Jacinto Heights area of Amarillo, paved with brick in 1927. Since the major cities of Texas were far to the south, there was little interest in improving Route 66. A dirt section between Alanreed and Groom became infamous as the Jericho Gap, where thick mud trapped vehicles. The runners in the Bunion Derby endured snow, sleet, and mud in their six-day journey across the Golden Spread. Ninety-three runners remained when they left Glenrio on April 4, 1928. In addition to the weather, the mud of the dreaded Jericho Gap caused several injuries. This section of Texas was hit hard by the same drought that drove so many farmers out of Oklahoma. The Panhandle endured 192 “dusters” between 1933 and 1936. About 35 percent of the farmers in the region left between 1935 and 1937. But Route 66 provided an economic lifeline for those who remained behind, and government relief programs put men to work paving the Jericho Gap. The paving across the state was finally complete in 1937. In August 1938, Amarillo hosted ceremonies dedicating Route 66 as the Will Rogers Highway. A big parade included Mrs. Will Rogers and Will’s favorite horse, Soapsuds. Motorcades from Chicago and Los Angeles met in Amarillo and a pageant with a cast of 1,500 depicted four hundred years of Southwest history. During World War II, leisure travel slowed dramatically and the 66 Highway Association disbanded. But another great migration took place, as families headed west to seek jobs at defense plants and facilities such as the Pantex Plant and the Amarillo Army Airfield. In 1947, the US Highway 66 Association was reorganized and could boast 66 had “800 miles of 4-lane highway.” But the section of two-lane between Shamrock and Amarillo became known as “Bloody 66.” By 1947, Route 66 had been improved to four lanes from the Oklahoma line almost to Groom, and from Amarillo to Bushland by 1954. Inspired by the autobahns of Germany he saw during World War II, President Dwight Eisenhower signed the Interstate Highway Act in 1956, providing federal money for a new system of superhighways. Interstate 40 would replace Route 66 across the panhandle. In 1962 the US Highway 66 Association met in Shamrock and passed a resolution asking highway officials to name the new route from Chicago and Los Angeles as Interstate 66. But the bureaucrats refused. By the 1970s, most of the Mother Road had been replaced by portions of five interstates across the United States: I-55, I-44, I-40, I-15, and I-10. Route 66 held on a little longer in Texas, because much of Interstate 40 used portions of the route to save construction costs and because of resistance by communities and business owners. It would be 1984 before McLean became the last community in Texas, and the second to last in the nation, to be bypassed. Route 66 was decommissioned in 1985. But the old road would not die. Travelers from all over the world still seek out the old motels, diners, and tourist traps along the Main Street of America. Route 66 is for those who think that the journey is as important as the destination. There isn’t much to see blasting across Texas on Interstate 40 at 75 miles per hour (121 kilometers per hour). The adventure is waiting at the next off-ramp. 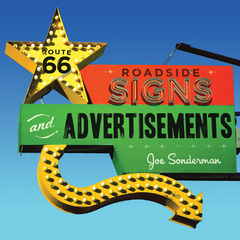 You can get your kicks–and pretty much anything else–on Route 66, provided you see the sign that s advertising it! Route 66 Roadside Signs and Advertisements showcases the colorful history of commercial signage along the Mother Road. From kitschy to classy, this book includes photos of early vintage signs as well as modern signs.